I went through security at the airport in Dublin behind someone with a bottle of water. I didn’t even have to take off my shoes. On board the flight to Frankfurt, a Lufthansa flight attendant armed me with a metal butter knife. I had to resist the sudden temptation to rush the cockpit with my new found power. Landing in Frankfurt for the connection to my Washington flight I had to clear security again. This time, I had to chug the water I bought in Dublin, remove my shoes and get wanded, just like every other passenger on the U.S.-bound flight. 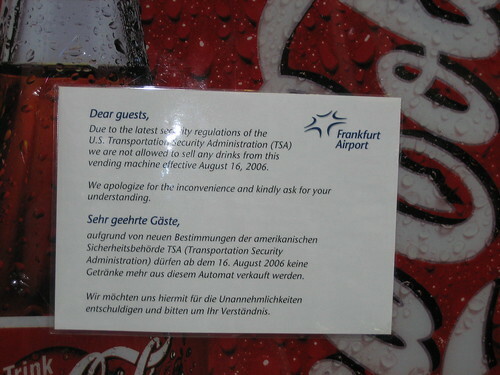 Within the sterile, enclosed holding area, the Coke machine was off limits due to TSA regulations. Over the years, the government has convinced the public that inconvenience equals security. It does not. It makes for stories on TV that the government is doing everything it can to protect the public. But it’s merely a show that masks the inaction of the TSA on real security measures. The recent so-called “security measures” are full of exemptions. Liquids and gels are not allowed, except when they are. You can have medication, but only if the label on the bottle matches the passenger’s name. (As if there were a standard, forgery-proof format for labels.) You can bring milk on board if you’re traveling with a baby. (Terrorists would never use a baby in a plot.) You can’t bring your own alcohol on a plane, but you can buy it from the duty-free store. And never mind that the government has known about the threat of liquid explosives for more than a decade. On board the United flight to Washington, I was given a business-class amenity pack that included toothpaste and body butter – items that would be confiscated if I were connecting to another flight and going through security checks a third time. These regulations are put in without any assessment of their cost to society. Every hour we spend waiting in line at the airport is a drain on productivity and leisure. Over the course of a year, I’ll spend more than two work weeks in time lost due to these fake security measures. That’s a cost of thousands of dollars shared by me and my employer. It’s a system run by politicians who prefer show over substance. At the same time that uniformed TSA screeners on the front lines are confiscating toothpaste and water bottles, unseen bureaucrats are cutting research and development spending for devices that can detect explosives. The government continues to allow unscreened cargo and mail on to those same planes. These get little attention, because the public doesn’t see them. Adrianna, I think that’s because you flew nonstop from Dublin to the U.S. – you got the TSA’s special TLC. The “nothing has happened since 9/11” argument that somehow proves the efficacy of both the DHS experiment and “war on terror” drives professionals within the intelligence and security community bonkers. Peter Tippett (pioneer of Norton antivirus) has a great analogy: Just because bowling balls could fall from the sky doesn’t mean we should start building homes with titanium roofs and outlawing convertibles. A logical approach to Risk Management indicates the cost of the cure often outweighs the cost of the disease. From the eyes of the terrorists, the ROI of utilizing planes for the attacks had less to do with the horror of killing 200 innocent people than it did with the quantity of jet fuel and the maneuverability the aircraft afforded. In that sense, despicably, they were innovators in that they evolved beyond the traditional hijack to exploiting possession of a highly explosive weapon capable of targeting deeply symbolic American assets. Horribly, the unfortunate passengers on those planes were not the primary goal. In this light, it might be argued that the London terrorists’ thwarted plan to blow up 6 planes as they crossed the Atlantic (using liquid bombs) arguably would not have had near the impact as 9/11. It’s likely then, that the most valuable step after 9/11 was the simplest: reinforcing the cockpit doors. Everything else has been for show. Darwin hypothesized that in nature, animals constantly assess risk: when we drive a car, walk in the woods (wrong part of town? ), buy a stock, bank online, use a credit card, stick a fork in the toaster, etc…The animals that can gauge risk accurately have a greater likelihood of survival. The ability to accurately assess risk and act upon it, therefore, equates to strength. The strong survive. Flying in a plane carries risk, similar to riding the metro. Removing the artificial – and by definition unstable – system created by the TSA, puts the responsibility back where it should be, thus eliminating unnecessary friction and heat from transportation and economic efficiency. When you fly, there’s a risk – however unlikely – that bad people will try to do you harm, so stay vigilant. That is a heckuva’ lot more honest than the charade we have now. It would be very difficult to argue that American representative democracy has fostered anything resembling good risk management. In fact, if the US President and Congress truly defined success as making the US a safer place, then the TSA, BGP and ICE – the whole concept of DHS should be scrapped for the ineffectual waste that it is. There is a complex and troublesome strategic problem that occurs when the inefficiency of democracy mixes with technology-empowered efficiency of society at large. Two of my three favorite Churchill quotes are “Democracy is the worst form of government, save for all the rest.” and “Rest convinced that Americans will always choose the right thing, but only after exhausting all other possibilities.” Our political system has always been reactive. The founders actually designed it that way, to support by default the status quo. It forces us to hit the iceberg before significant change can occur, which works until you hit icebergs the size of emancipation, civil rights, WWI/II, Vietnam, Watergate, 9/11 that nearly sink the country in the process. It’s arguable that as time goes on however, the evolution to proactive (pre-emptive?) change becomes even more requisite. For example, if we were to able to represent advancements in technology over the last 500 years on an xy axis, the slope would be ascend geometrically – or exponentially – into the upper right quadrant for as far as we can project. Similar to Moore’s law, the theory goes that technology gets better, faster, enabling greater productivity over time. However, if we were to overlay man’s ability to harness technology in the form of “sociological progression” on that same graphic, we’d see a much different result, in fact, the slope may have even flat lined. The abolishment of slavery, women’s suffrage, the civil rights movement – but the progression is in no way similar to that of technological advancement, and over time – assuming the status quo – the delta only gets greater. This is what keeps those within the US intelligence community up at night. They realize that in our lifetimes, we’re likely to see the 100th birthday of the nuclear age. The pre-Napoleon madmen of just 250 years ago were somewhat limited to what they could do, but what will the dual-edged sword of enhanced productivity enable in 50 to 100 year’s time? Neither Hegel or Hobbes paint a pretty picture as to where this leads, which helps explain how seemingly insane programs like “total information awareness”, the Patriot Act and pre-emptive war in Iraq come to be. The Iraq war is likely about many things, but at its core I believe it’s a high stakes gamble to try bridge the gap in terms of thought – although naïve and unsophisticated in its design to introduce democracy without taking into account building blocks such as literacy, women’s rights, a middle class, etc…and of course, incompetent execution – because the alternative is a frightening scenario. Up until only about 500 years ago, foreign policy was a lot more expedient – you simply killed every man, woman and child that didn’t agree with you. Granted, any vision of the web that focuses on its positive characteristics must keep a pragmatic eye on its darker potential, but what drives my passion is that the pros far outweigh the cons. The Web’s ability to globally share near-instantaneous ideas and information can enable the creation of meaningful social networks that can span the gaping culture and language barriers. The Internet has the potential to be the viable alternative that avoids the nightmarish Orwellian/Hegellian/Hobbesian visions of the future. Rocky, whether we end up working together or not, it would be fun to synch up/stay in touch. I see a lot of similarities in the way we view things.